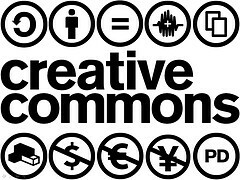 "Creative Commons is a nonprofit organization that enables the sharing and use of creativity and knowledge through free legal tools. Creative Commons licenses are not an alternative to copyright. They work alongside copyright and enable you to modify your copyright terms to best suit your needs." If using photographic material, major sites such as Google Images and Flickr have advanced searches that allow you to limit your search terms to items with Creative Commons licenses. The Canvas LMS also has the capability of finding images on Flickr Creative Commons when inserting an image on a page. Attribution - This license lets others distribute, remix, tweak, and build upon your work, even commercially, as long as they credit you for the original creation. Attribution-ShareAlike - This license lets others remix, tweak, and build upon your work even for commercial purposes, as long as they credit you and license their new creations under the identical terms. Attribution-NoDerivs - The license allows for redistribution, commercial and non-commercial, as long as it is passed along ​unchanged and in whole, with credit to you. Attribution-NonCommercial - This license lets others remix, tweak, and build upon your work non-commercially; new works must also acknowledge you and be non-commercial, but they don’t have to license their derivative works on the same terms. Attribution-NonCommercial-ShareAlike - This license lets others remix, tweak, and build upon your work non-commercially, as long as they credit you and license their new creations under the identical terms.